MTV was right to reboot the old Rikki and Vikki Mongeon show, Double Shot at Love, with former Jersey Shore stars DJ Pauly D and Vinny Guadagnino. So far, the show, which premiered last week, has already seen fantastic ratings, with nearly one million viewers tuning in to the show’s commercial-free premiere. 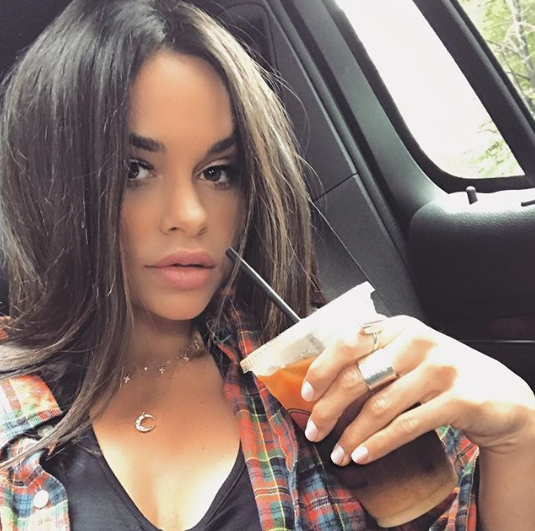 This puts Double Shot at Love in first place for unscripted cable series debuts in 2019, and makes it MTV’s second highest series premiere among viewers aged 18-49 in over 5 years, with only Jersey Shore: Family Vacation beating it out for the coveted spot of No. 1. But ratings aside, some of the show’s many new fans are taken by the series’ 20 attractive female contestants, who are all competing against each other for the very sought-after prize of winning the love of Vinny and Pauly D. And one contestant, the very peculiar Christina Lawrence, is on every fan’s radar after last week’s premiere. Christina Lawrence is more than just your average yoga trainer. And all that’s required is about thirty seconds of seeing her work her magic on the show to understand just how competitive she is, and just how serious she is about fitness. While meeting the rest of the cast and eventually making friends with the gorgeous Victoria Fryer, Christina revealed a bit about her… let’s call them “restrictive” eating habits. Christina’s amazing yoga bod comes at a pretty high price. If you’ve taken a recent look at this yoga instructor, you know she is absolutely ripped. I’m talking abs you can grate literal cheese on. But if you want a body like hers — who wouldn’t? — be warned that it means being super strict with what you put in it. “I have celiac disease so I’m allergic to gluten,” she begins by saying in a deleted scene. Mind you, the topic of conversation isn’t about the contestants’ eating habits; instead this is a pleasant get-to-know-one-another before the ladies decide on roommates. Gluten is in fact a group of proteins, but OK. “So like, you go and you think you’re having sushi,” Christina continues, “you pour soy sauce on it — and Boom! You’re gluten-ed.” Although she seems relatively insufferable, Christina is also kind of a favorite for her ability to give zero damns. Exhibit A: when a fellow contestant stands up in the middle of Christina’s lecture, saying, “This is the most awkward conversation,” the yoga instructor just keeps holding court. “Like, I only have my fish wild-caught,” she continues without missing a beat. “I only eat organic meats or eggs, but I try to stay away from chicken or red meat. Farm-raised is disgusting. And then I just like vegetables and then I’ll teach classes and clean. I love cleaning. I love moving and picking s–t up and putting it into places,” she says while periodically ripping her Juul vape. “So are we gonna be roommates?” she asks Victoria before splaying out on top of her totally non-consensually. Victoria pulls the bossest move of them all by flat out ignoring Christina, who seems thoroughly unbothered by it all. We stan, we stan. Christina is launching her own yoga and workout videos. “Christina knew from a very young age that her passion would combine mind, body, and wellness,” her bio on VeganSmart reads. “She started classical ballet at the age of 3 … started taking Pilates … then added Yoga into her fitness portfolio.” These days, when she’s not competing for the love of America’s most famous guidos, she teaches both yoga and pilates. And according to her Instagram page, she has no plans of stopping. In fact, she’s on her way to building her own brand, Dream Body by Christina, which she reps on nearly all of her most recent Instagram posts. “I’m so happy to be sharing myself with you guys!” she posted earlier this year. Follow Christina and DBBC on Instagram. Christina tags @dreambodybychristina‘s Instagram account, though it doesn’t have any posts as of yet. Follow her on her personal page, as well as on DBBC to see what the brunette is concocting and hopefully to get in on some of her fitness videos. Considering her dream bod, Christina probably knows what she’s talking about. And there might even be a tip or two we could stand to take away from the way she eats and exercises. Watch Christina on Double Shot at Love on Thursdays at 8 p.m. on MTV.